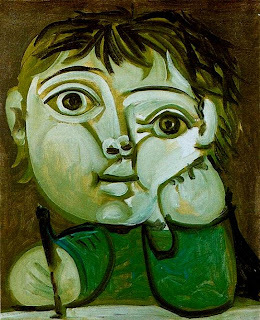 Pablo Ruiz Picasso (born October 25, 1881 - died 8 April 1973 at age 91 years) was a famous artist in cubism and is known as a revolutionary painter in the 20th century. Artistic genius capable to make a sculpture, graphics, ceramics, costumes ballet dancers to the stage. Born in Malaga, Spain October 25, 1881 in Pablo's full name (or El Pablito) Diego Jose Santiago Francisco de Paula Juan Nepomuceno Crispin de los Remedios Cipriano Crispiniano de la Santísima Trinidad Ruiz Blasco y Picasso López. His father was Jose Ruiz Blasco, an art professor and his mother was Maria Picasso Lopez. Picasso has properties that are always eager to learn. Differences in city or country is not an obstacle to obtaining various sciences. At the age of 14, he passed the entrance exam School of Fine Arts in Barcelona and two years moved to Madrid to study at the Royal Academy. Shortly thereafter he returned to Barcelona and the Els Quatre Gats joined, where poets, artists and critics to exchange ideas come from outside Spain. At the age of 23, Picasso moved to Paris, the city center of the art world at that time. Many famous artists are characterized by a range of basic styles. Picasso was not the case. He displays the vast spaces of various styles are amazing. Art critics to label as "blue period," "pink period," "neo-classical period" and so on. He is one of the forerunner of "Cubism," He sometimes participating, sometimes opposed to new developments in the world of painting, modern painting. Perhaps no painter in history who could do the work of such high quality to pass so many styles and ways. 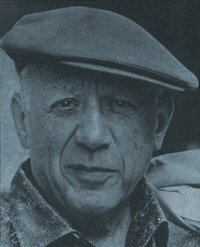 Picasso produced 20,000 works in his life. Interestingly, Picasso's painting style changed frequently. This can happen because Picasso had many friends. As of the painting style of blue and pink (for a painting dominated by blue and pink) drastically changed the style of cubism, due to the influence of his friendship with Georges Braque. Cubism style art world this is surprising, because it will change people's perception of the beauty of art. If the previous woman recognizable face painting the model, by Picasso paintings made drastic that form beyond recognition, as he poured through the work Demoiselles d'Avignon. This does not mean carelessly Picasso paintings. He had been studying the works of sculptor Iberian and African sculptures (sculptures primitive) which are usually curved and not proportional. The lack of Gratuitous Picasso also proved by several experiments that often, especially in the perspective and the distortions that exist in a painting. So the style of Picasso's cubism findings of this assessment will change the world insight into a painting. painting not only as the beauty of art, but is also as a result of research and experimentation. Picasso is a melancholy artist, strong personality, self-centered and life is free. Not surprisingly, many of his works reflect kepribadiannnya it. Strong personality, self-centered and free, a lot of looks from the impressive work of art is controversial and very expressive, different than ever before. On the other hand, Picasso kemelankolisan revealed a highly sensitive nature as well as detailed in the assessment of a fact of life. He was able to make a reality of life as a source of inspiration for his work. For example. Love painting Mesra (blue period) the atmosphere gloomy and pessimistic, reflecting the hard times in the middle of Picasso's competitive situation. Guernica painting that became the center of the eye at the Reina Sofia Museum (Madrid) is scratching his memory at the hands of the bloody tragedy of the early 1930s in the Basque region, Guernica occurs when the civil war and the collapse of hundreds of bombs. Then the dove, symbol of world peace, it is also a design. Picasso completed the graphic arts after terisnpirasi by birds of Melanesia, the provision of Henri Matisse.